Few people enjoy cleaning their homes, it’s a chore that needs to be done and for many people, the quicker the better. However, if you are going to spend the time and effort cleaning your home then it makes sense to do a proper job, at least that way you won’t have to do it so often. If it’s worth doing then it’s worth doing properly and this motto applies to vacuuming as well. 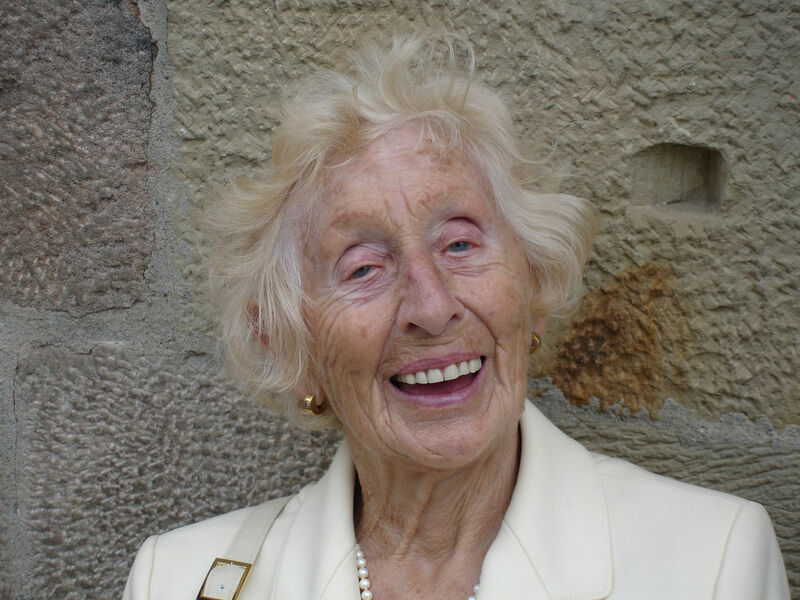 For this post I went to an expert, Mrs Anne Richmond, who has had an extensive career managing the cleaning of some of the top hotel rooms in the country. With over 30 years of professional cleaning experience I can think of few better people who know how to clean efficiently and well. These are her recommendations. For efficient vacuuming you need to tidy up first. Objects scattered around on the floor will only hinder your progress and having to stop half way is time consuming, after all, we’re trying to make this a quick, efficient process right? Go around your living area and pick up any stray objects off the floor, old socks and pieces of string are some of the worst offenders for clogging your vacuum and possibly even damaging the motorised cleaning head, or at least blocking the suction. Which means you have to stop, clean, sort out the problem and then continue. Without proper preparation a simple job can escalate into a maintenance nightmare. So do it right, first step, tidy up. This is simple when you think about it, but dust falls downwards. So clean things that are high first, before vacuuming. That means dusting bookshelves, wiping the top of windowsills and picture frames and dusting ornaments. Any dirt or dust that you fail to pick up on the duster will fall to the floor, no problem; you can hoover it up later. Following on from the last point, you should always clean upstairs rooms first. When you start vacuuming start with the upstairs floors and then move to the stairs. 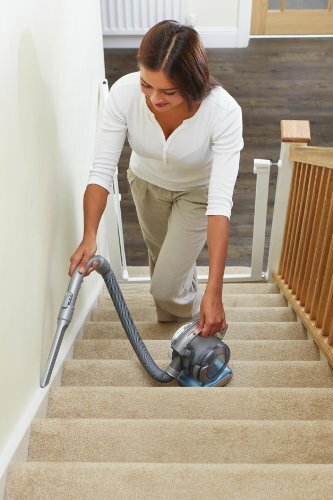 Not only will this efficiently clean any dust that is falling down from above but also the vacuum will be at the top of the stairs and is much easier to moved down a step at a time than having to lift it upwards. 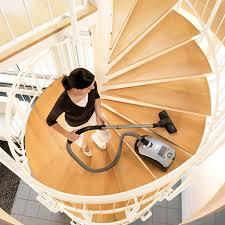 Any dust that is knocked off the top step will be caught and hovered up when you vacuum the next lower step. Easy! Many people vacuum by using many short back and forth movements, this is terribly inefficient and you are likely to miss spots too. The best way to vacuum is to do so in straight lines up and down the room. Imagine you are mowing a lawn in stripes, gardeners know that not only does this look smart, it is also the quickest and most efficient way to mow a lawn. You should do the same thing when vacuuming a room. Still not convinced? Just look at search and rescue patterns, they are designed to cover every part of a specific area; you can apply the same method to your rooms. Some areas might need going over twice, although this is possibly down to your vacuum cleaner. Modern cordless vacuums and powerful house vacuums such as those made by Dyson or Morphy Richards Vacuums are excellent and you almost never need to double back over an area. Dust and debris tends to accumulate in the corners of rooms. This is especially so for rooms with wood floors or tiles. You should use the crevice tool on your vacuum to get right into the corners and along the edges of walls and other fixed objects. A real pro cleaning trick is to only clean the edges of things. People tend to notice when there are strong contrasts between say a wall and a clean carpet, or a really clean edge to a mirror. Why do you think everything always looks so good when freshly painted? It’s the bright, even, clean colour contrast. So pay attention to the corners and edges and your cleaning will be noticed by all. 6. BONUS! Total Cleaning Life Hack! If you have ever worked as a professional cleaner in hotels, then one of the first things they teach you is how to clean a room properly. A great tip, especially if you are pressed for time is to open the curtains wide and make the bed first. The room will immediately be transformed and well on its way to being totally neat and tidy. People are suckers for first impressions, if someone walks into a bright room and sees a neatly made bed then they will often overlook the fact that the carpet has not been vacuumed, or the other jobs. It sets people in a good frame of mind and they are less likely to see other faults. Excellent article Roger! I Always enjoy reading your tips. Keep it coming!